In my professional development activities with teachers I often build in opportunities to learn using wikis. For many, it’s the first time they’ve edited a wiki so these activities provide useful exposure to the technology. But for me the key benefit is that wikis provide a tool for learners to organise their thinking as a key stage in writing, publishing and collaborating. In an earlier post I’ve talked about the benefits of read-write learning in professional development. See also the read-write matrix of web 2.0 tools for learning. Since I like to focus on the cognitive benefits of wikis, I try to avoid spending too much time on how to use the wiki. I also like to keep participants focused on the thinking aspects of writing rather than the more mechanical aspects. In other words, I don’t spend time on the features which are more related to ‘making text pretty’, but I do spend time on features related to ‘organising thoughts’. In fact, I like to eliminate anything which gets in the way of the thinking process at this stage. In practice, this means that once learners know how to go into edit mode, they need to find out how to create a link to a new page very quickly. And since unexpected new pages and links get in the way of the thinking process, I turn off CamelCase linking if possible and focus on using square brackets for links. That’s quick and easy to demonstrate and learners can be creating a multi-page wiki resource in just a few minutes. If we’re using Mediawiki, headings are important since they provide structure to the page through the automatic table of contents. In other wiki software where a heading is primarily a formatting feature, I don’t spend time on this. Lists (ordered and unordered) are also very useful for organising thoughts, so that’s something else which I tend to demonstrate reasonably early on. Tables are another strategy for organising text – unfortunately the wiki markup for creating tables tends to be confusing for learners. Where the wiki software has a WYSIWYG editor inserting a table is fairly straightforward. But if you’re using Mediawiki then a tool such as Shawn Douglas’s Excel-to-Mediawiki converter might be useful. Of course, once the writing process is further down the track, learners do want to ‘pretty up’ their text and that’s perfectly valid – that’s when ‘just in time’ learning has its place! In fact, learners mostly work the formatting stuff out for themselves anyway – if the wiki has a WYSIWYG editor the toolbar is very familiar. If they have to use wiki markup, I show them how to get to the editing help page and leave them to it. 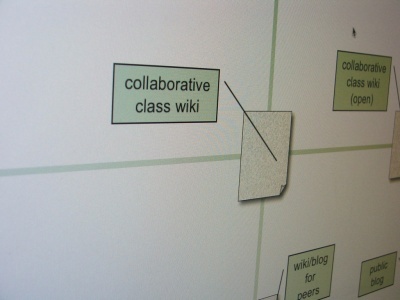 This entry was posted in Tools and tagged organising, thinking, wiki features, wiki in education, writing on June 16, 2008 by Paul Left.